A croissant (UK: /ˈkrwʌsɒŋ/; US: /krwɑːˈsɒ̃/, /krəˈsɒnt/; French pronunciation: [kʁwa.sɑ̃] ( listen)) is a buttery, flaky, viennoiserie pastry of Austrian origin, named for its historical crescent shape. Croissants and other viennoiserie are made of a layered yeast-leavened dough. The dough is layered with butter, rolled and folded several times in succession, then rolled into a sheet, in a technique called laminating. The process results in a layered, flaky texture, similar to a puff pastry. Crescent-shaped breads have been made since the Renaissance, and crescent-shaped cakes possibly since antiquity. Croissants have long been a staple of Austrian and French bakeries and pâtisseries. In the late 1970s, the development of factory-made, frozen, pre-formed but unbaked dough made them into a fast food which can be freshly baked by unskilled labor. The croissanterie was explicitly a French response to American-style fast food, and as of 2008 30–40% of the croissants sold in French bakeries and patisseries were baked from frozen dough. Croissants are a common part of a continental breakfast in France. The kipferl, the ancestor of the croissant, has been documented in Austria going back at least as far as the 13th century, in various shapes. The kipferl can be made plain or with nuts or other fillings (some consider the rugelach a form of kipferl). Some Egyptians claim, arguably, that the kipferl may have been based on the feteer meshaltet pastry known to the Egyptians. The birth of the croissant itself—that is, its adaptation from the plainer form of kipferl, before the invention of viennoiseries—can be dated to at least 1839 (some say 1838) when an Austrian artillery officer, August Zang, founded a Viennese bakery ("Boulangerie Viennoise") at 92, rue de Richelieu in Paris. This bakery, which served Viennese specialties including the kipferl and the Vienna loaf, quickly became popular and inspired French imitators (and the concept, if not the term, of viennoiserie, a 20th-century term for supposedly Vienna-style pastries). The French version of the kipferl was named for its crescent (croissant) shape and has become an identifiable shape across the world. By 1869, the croissant was well established enough to be mentioned as a breakfast staple, and in 1872, Charles Dickens wrote (in his periodical All the Year Round) of "the workman's pain de ménage and the soldier's pain de munition, to the dainty croissant on the boudoir table"
The puff pastry technique which now characterizes the croissant was already mentioned in the late 17th century, when La Varenne's Le Cuisinier françois gave a recipe for it in the 1680 and possibly earlier, editions. It was typically used not on its own but for shells holding other ingredients (as in a vol-au-vent). It does not appear to be mentioned in relation to the croissant until the 20th century. According to one of a group of similar legends, which vary only in detail, a baker of the 17th century, working through the night at a time when his city (either Vienna in 1683 or Budapest in 1686) was under siege by the Turks, heard faint underground rumbling sounds which, on investigation, proved to be caused by a Turkish attempt to invade the city by tunneling under the walls. The tunnel was blown up. The baker asked no reward other than the exclusive right to bake crescent-shaped pastries commemorating the incident, the crescent being the symbol of Islam. He was duly rewarded in this way, and the croissant was born. The story seems to owe its origin, or at least its wide diffusion, to Alfred Gottschalk, who wrote about the croissant for the first edition  of the Larousse Gastronomique and there gave the legend in the Turkish attack on Budapest in 1686 version; but on the history of food, opted for the 'siege of Vienna in 1683' version. However, many in the Arab world hold to an alternate Muslim origin for the croissant. In this account, the croissant is thought to originate from the feteer meshaltet, a flaky, layered pastry known to the Egyptians since the Eighteenth Dynasty (c.1292 BCE or earlier). 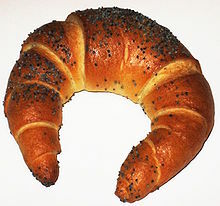 During the Mamluk period (1250–1517 CE), a crescent-shaped variant of feteer meshaltet called "feteer halali" (crescent feteer) emerged and spread to Europe and France, where it became known as the croissant. Uncooked croissant dough can also be wrapped around any praline, almond paste, or chocolate before it is baked (in the last case, it becomes like pain au chocolat, which has a different, non-crescent, shape), or sliced to include sweet or savoury fillings. It may be flavoured with dried fruit such as sultanas or raisins, or other fruits such as apples. In France and Spain, croissants are generally sold without filling and eaten without added butter, but sometimes with almond filling. In the United States, sweet fillings or toppings are sometimes used, and warm croissants may be filled with ham and cheese, or feta cheese and spinach. In the Levant, croissants are sold plain or filled with chocolate, cheese, almonds, or zaatar. In Germany, croissants are sometimes filled with Nutella or persipan; in southern Germany, there is also a popular variety of a croissant glazed with lye (Laugencroissant). In the German-speaking part of Switzerland, the croissant is typically called a Gipfeli; this usually has a crisper crust and is less buttery than the French-style croissant. Croissants are commonly served alongside coffee for breakfast or merienda, a light mid-morning or mid-afternoon meal. They are referred to as medialunas ("half moons") because of their shape and are typically coated with a sweet glaze (medialunas de manteca, "half moons of butter"). Another variant is a medialuna de grasa ("half moon of lard"), which is not always sweet. A cousin of the croissant is the Italian cornetto (in the Center and South) or brioche (in the North). These variants are often considered to be the same, but that is not completely true: the French version tends to be crispy and contains a lot of butter, whereas an Italian cornetto or brioche is usually softer. Furthermore, the cornetto vuoto (Italian: "empty cornetto") is commonly accompanied by variants with filling, which include crema pasticciera (custard), apricot jam or chocolate cream. They often come covered with powdered sugar or other toppings. Cornetto with cappuccino at the bar is considered[by whom?] to be the one of the most common breakfasts in Italy. On November 11, St. Martin's Day is celebrated in Greater Poland, mainly in its capital city Poznań. On this day, the people of Poznań buy and eat considerable amounts of sweet, crescent-shaped pastries called rogale świętomarcińskie ("St. Martin's croissants"). They are made specially for this occasion from puff pastry with a filling made of ground white poppy seeds, almonds, raisins, and nuts. The first type of Portuguese croissant is similar to the French, and can be plain or filled with custard, chocolate, fruit jam, or a typical Portuguese cream made of egg yolk and sugar, "doce de ovo". It is customary for these to also have powdered sugar on top. The second version has a similar consistency to brioche and is commonly eaten with ham and cheese. Sometimes this type is also served like toast, with a spread of butter. While the first type of croissant is considered a sweet and is eaten during breakfast or tea, the second type is a more filling meal and is usually considered a sandwich and often prepared for picnics or as travel food. Both types share the same name (French/Portuguese: "croissant") but are typically found in different bakeries: the sweet croissant is more commonly found in Portuguese pâtisseries and the brioche croissant is usually found in coffeehouses. A remote similarity of the croissant shape is the Turkish ay çöreği. It is filled with cinnamon, walnut, hazelnut, cacao and raisin. Its rectangular shape variant is known as pastiç or İzmir çöreği. It is generally eaten during breakfast or with tea. The first step of manufacturing croissants is the "predough" formation. To prepare predough, flour, water, in-dough fat, yeast, salt, and sugar are mixed together in a single step. Typically, croissant predough is mixed in a relatively cool environment, for a longer time than other pastries. The ideal temperature of the dough should be around 19 °C, to best hydrate the ingredients. In comparison to the mixing of bread dough ingredients, pastry predough is considered underdeveloped in that mixing is stopped as soon as the dough appears homogeneous, to allow for further dough development in the next step. The second step is the lamination process. Lamination is necessary to produce multilayered dough with alternating layers of predough and fat. Generally, there are two methods for folding fat into the dough: the English method and the French method. In the English method, one fold results in two fat layers and three dough layers. After spreading out predough, roll-in fat is flattened to a similar thickness as the predough and spread over two-thirds of the surface of the laminated predough. The exposed third of predough is then folded over half of the roll-in fat, while the other end (one predough and one fat layer) is folded on top. In the French method, one fold results in one fat layer and two dough layers. After spreading out the predough and putting a layer of roll-in fat over the center surface of the dough, the corners of the predough are folded toward the middle of the fat. Croissant dough is typically laminated until 16-50 fat layers are obtained. The optimal number of layers can be determined by balancing certain crumb properties with specific volume. On one hand, a low number of layers yields large specific heights as well as irregular crumb structure with large voids. On the other hand, a large number of relatively thin layers leads to interconnections between different dough layers as well as less dough lift. After lamination, the dough is formed into its famous crescent shape. First, the laminated dough is cut into triangles of the desired size. The triangles are then rolled with three-and-a-half to four full turns, and finally, the ends of the roll are curved inwards to form a crescent. The third step is the fermentation process. Croissants are different from other puff pastries in that they include yeast which, during proofing, increase the dough volume. Ideally, the optimum croissant quality is achieved at a yeast level of 7.5%, with a proof time of 60 minutes at 31 °C. The croissants are finished proofing when the dough has expanded two-and-a-half times its original volume. The fourth step is the baking process. Also known as "pastry lift" or "dough lift," the dough expands as water is converted to steam, thus increasing the pressure between each dough layer. As a result, the croissant dough rises up to yield its characteristic flaky texture. Depending on the type of oven used and specific size of the croissant, the baking time can range from 10–20 minutes and the oven temperature can be set anywhere from 165 °C to 205 °C. The final steps are the cooling and storage of the croissant. Croissants are generally not stored for very long and are typically consumed soon after baking. Gluten proteins affect the water absorption and viscoelastic properties of the predough. The role of proteins can be divided into two stages of dough formation: hydration and deformation. In the hydration stage, gluten proteins absorb water up to two times their own weight. In the deformation or kneading stage, the action of mixing causes the gluten to undergo a series of polymerization and depolymerization reactions, forming a viscoelastic network. Hydrated glutenin proteins in particular help form a polymeric protein network that makes the dough more cohesive. On the other hand, hydrated gliadin proteins do not directly form the network, but do act as plasticizers of the glutenin network, thus imparting fluidity to the dough’s viscosity. Water content affects the mechanical behavior of predough. As previously discussed, water is absorbed by gluten and starch granules to increase the viscosity of the dough. The temperature of the water is also important as it determines the temperature of the predough. In order to facilitate processing, cold water should be used for two main reasons. First, chilled water provides a desirable environment for gluten development, as the temperature at which mixing occurs impacts the dough’s hydration time, consistency, and required amount of mixing energy. Secondly, cold water is comparable to the temperature of the roll-in fat to be added later, which better facilitates the latter’s incorporation. In-dough fat affects the texture and lift of predough. Although higher levels of dough fat may lower dough lift during baking, it also correlates with a softer end product. As such, the main function of in-dough fat is to produce a desirable softness in the final croissant. In laminated croissant dough, the gluten network is not continuous. Instead, the gluten proteins are separated as thin gluten films between dough layers. The formation of thin, well-defined layers affects the height of dough lift. Generally, laminated croissant dough contains less layers than other puff pastry doughs that do not contain yeast, due to the presence of small bubbles in the gluten sheets. Upon proofing, these bubbles expand and destroy the integrity of the dough layers. The resulting interconnections between different dough layers would over-increase dough strength and allow water vapor to escape through micropores during baking, consequently decreasing dough lift. The role of fat also influences the separation of layers, as will be discussed next. Roll-in fat affects the flakiness and flavor of the croissant. In laminated dough, fat layers alternate with dough layers. As such, the most important function of roll-in fat is to form and maintain a barrier between the different dough layers during sheeting and folding. As previously stated, the ability for fat to maintain separation between folded dough layers ensures proper dough lift. The type of roll-in fat used is typically butter or margarine. Butter and margarine are both water-in-oil emulsions, composed of stabilized water droplets dispersed in oil. While butter is appealing due to its high consumer acceptance, its low melting point, 32 °C, actually makes it undesirable for production purposes. The use of butter as roll-in fat during the lamination step will cause problems of oiling out during sheeting and fermentation if the temperature is not tightly controlled, thus disrupting the integrity of the layers. On the other hand, kinds of margarine are commonly used as roll-in fat because they facilitate dough handling. Generally, roll-in margarine should have a melting point between 40 °C and 44 °C, at least 3 °C higher than the fermentation temperature to prevent oiling out prior to baking. It is also important to consider the plasticity and firmness of the roll-in fat, which is largely determined by its solid fat content. Generally, a greater proportion of solid fat coincides with larger croissant lift. At the same time, the roll-in fat should have plasticity comparable to that of the dough, such that the fat layers do not break during sheeting and folding. If the fat is firmer than the dough, then the dough can rupture. If the fat is softer than the dough, then it will succumb to the mechanical stress of sheeting and potentially migrate into the dough. In order to ensure the flaky texture of the croissant, it is important to balance the yeast activity with steam production. If the yeast overproduces CO2, then the well-defined layers may collapse. During the baking process, this would cause steam to escape too early from the bread, reducing dough lift and flakiness of the final product. Thus, to offset the negative effects of yeast on layer integrity and dough lift, croissants usually contain less layers than other puff pastries. During baking, the transient gluten network turns into a permanent network. At higher temperatures, intermolecular disulfide bonds form between glutenin molecules, as well as between gliadin and glutenin. With more bonds being made, the gluten network becomes more rigid, strengthening the croissant’s crumb texture. Additionally, the baking process significantly stretches the dough layers due to the large macroscopic deformation that occurred during fermentation’s dough lift. Starch undergoes gelatinization as a result of baking. Prior to baking, starch granules absorb a small amount of water at room temperature as it is mixed with water to form predough. As long as the dough’s temperature stays under the gelatinization temperature, this granule swelling is limited and reversible. However, once the baking process begins and the dough is exposed to temperatures above the gelatinization temperature, amylopectin crystallites become more disordered inside the starch granules and cause an irreversible destruction of molecular order. At the same time, starch gelatinization actively draws water from the gluten network, further decreasing the flexibility of the gluten. Currently, the extent of amylose leaching and granular structure distortion during the baking of croissants is still unknown. Roll-in fat gradually melts as the temperature in the oven increases. Some of the melting fat can migrate into the dough, which could then interfere with gluten protein crosslinking. The fat phase also contributes to dough lift through gas inflation, which will be described next. Water is converted to steam during the baking process, which is the main factor behind the leavening of the dough. The water for steam production comes from both the dough layers and the roll-in fat. As the fat melts, the continuous oil phase is no longer able to stabilize the water droplets, which are then released and converted to steam. Although the exact mechanism of steam entrapment is still unclear, it is likely a result of both steam expanding inside each dough layer and steam migrating to oil layers, where it inflates gas bubbles. The steam migration to oil phase is likely due to the smaller pressure differential required to inflate a bubble of steam in liquid fat than in solid dough. As the concentration of steam increases between dough layers, the increased pressure causes the dough to lift. It is important to note that during the entire baking process, only half of the water vapor contributes to dough lift, as the other half is lost through micropores and capillaries of interconnected dough layers. The effect of gluten proteins during cooling and storage is still unclear. It is possible that gluten proteins influence croissant firming through the loss of plasticizing water, which increases the stiffness of the gluten network. Starch plays a major role in the degradation of croissants during storage. Amylopectin retrogradation occurs over several days to weeks, as amorphous amylopectin chains are realigned into a more crystalline structure. The transformation of the starch causes undesirable firmness in the croissant. Additionally, the formation of the crystal structure of amylopectin requires the incorporation of water. Starch retrogradation actively draws water from the amorphous gluten network and some of the amorphous starch fraction, which reduces the plasticity of both. Water migration influences the quality of stored croissants through two mechanisms. First, as previously stated, water redistributes from gluten to starch as a result of starch retrogradation. Secondly, during the baking process, a moisture gradient was introduced as a result of heat transfer from the oven to the croissant. In fresh croissants, there is high moisture content on the inside and low moisture content on the outside. During storage, this moisture gradient induces water migration from the inside to the outer crust. On a molecular level, water is lost from the amorphous starch fraction and gluten network. At the same time, water diffuses from the outer crust to the environment, which has less moisture. The result of this redistribution of water is a firming up of the croissant, caused by a decrease in starch plasticity and an increase in gluten network rigidity. Due to the presence of large pores in croissants, moisture is lost to the environment at a faster rate than bread products. As such, croissants generally become harder in texture at a faster rate than breads. Fat also affects the quality of croissants in storage. On one hand, an increased amount of in-dough fat has been found to correspond to a reduction in crumb hardness immediately after baking. This is likely attributed to the high-fat content of croissants, as increased fat levels decrease moisture diffusion. On the other hand, although roll-in fat softens the croissant’s initial crumb, its effect on croissant hardness during storage is still unclear. ^ "Qu'est-ce que la Bible? d'après la nouvelle philosophie allemande", translated by August Hermann Ewerbeck. 1850. p. 327. Hebrew women, in the time of Jeremiah, made in honor of the pagan goddess Astarte (queen of heaven, queen of the moon) cakes, probably in the form of a crescent. ^ a b عبدالقادر, اسراء (June 8, 2017). "حكاية أكلة.."الفطير المشلتت" من قرابين لآلهة الفراعنة لأكلة "الصباحية"". اليوم السابع. Retrieved 26 June 2018. ^ a b Marzouk, Sarah (February 12, 2017). "A Brief History of Fiteer, Egypt's Pizza-Like Pastry". The Culture Trip. Retrieved June 26, 2018. ^ The 1839 date, and most of what follows, is documented in Jim Chevallier, August Zang and the French Croissant: How Viennoiserie Came to France, p. 3–30; for the 1838 date, see Giles MacDonogh "Reflections on the Third Meditation of La Physiologie du goût and Slow Food" Archived 3 March 2016 at the Wayback Machine (p. 8); an Austrian PowerPoint – Ess-Stile Archived 29 May 2012 at the Wayback Machine – gives the date of 1840 (slide 46). A 1909 image of the bakery shows the same date for its founding, but the bakery was already documented in the press before that. ^ Chambers' Edinburgh Journal, 1847, p. 254. ^ Mme. de Genlis, "Manuel de Voyage", Berlin, P. T. de Lagarde, 1799, pp. 54–56. ^ Gottschalk, Alfred (1948). Histoire de l'alimentation et de la gastronomie depuis la préhistoire jusqua'à nos jours: Illus. documentaires (in French). Editions Hippocrate. Archived from the original on 16 February 2017. ^ Davidson, Alan (1999). Oxford Companion to Food. Oxford University Press. p. 232. via Lynne Olver (ed.). "Croissants". The Food Timeline. ^ Groden, Claire (2 August 2013). "Syrian Rebels Ban Croissants in Aleppo". Time. Archived from the original on 7 August 2013. Retrieved 9 August 2013. ^ Amira (May 24, 2013). "Egyptian Feteer Meshaltet". Amira's Pantry. Retrieved June 26, 2018. ^ "Pastane Ay Çöreği". 23 October 2014. Archived from the original on 20 December 2016. Retrieved 11 December 2016. ^ "İzmir Çöreği (Pastiç)". 14 February 2016. Archived from the original on 20 December 2016. Retrieved 11 December 2016. ^ a b c d e f g h i j k l m n o p q r s t Ooms, Nand; Pareyt, Bram; Brijs, Kristof; Delcour, Jan A. (2016-10-02). "Ingredient Functionality in Multilayered Dough-margarine Systems and the Resultant Pastry Products: A Review". Critical Reviews in Food Science and Nutrition. 56 (13): 2101–2114. doi:10.1080/10408398.2014.928259. ISSN 1040-8398. PMID 26177127. ^ a b c d Bakeinfo. "Information Sheets- BakeInfo (Baking Industry Research Trust)". www.bakeinfo.co.nz. Archived from the original on 20 December 2016. Retrieved 14 December 2016. ^ a b c Bent, Alan J. (2007-01-01). "Speciality Fermented Goods". Technology of Breadmaking. Springer US. pp. 245–274. doi:10.1007/0-387-38565-7_9. ISBN 9780387385631. ^ Wieser, Herbert (2007-04-01). "Chemistry of gluten proteins". Food Microbiology. 24 (2): 115–119. doi:10.1016/j.fm.2006.07.004. ISSN 0740-0020. PMID 17008153. ^ a b Goesaert, H.; Brijs, K.; Veraverbeke, W. S.; Courtin, C. M.; Gebruers, K.; Delcour, J. A. (2005-01-01). "Wheat flour constituents: how they impact bread quality, and how to impact their functionality". Trends in Food Science & Technology. Second International Symposium on Sourdough - From Fundamentals to ApplicationsSecond International Symposium on Sourdough - From Fundamentals to Applications. 16 (1–3): 12–30. doi:10.1016/j.tifs.2004.02.011. ^ Huang, Weining; Kim, Yangsoo; Li, Xianyu; Rayas-Duarte, Patricia (2008-11-01). "Rheofermentometer parameters and bread specific volume of frozen sweet dough influenced by ingredients and dough mixing temperature". Journal of Cereal Science. 48 (3): 639–646. doi:10.1016/j.jcs.2008.02.008. ^ McClements, David Julian (2010-03-04). "Emulsion Design to Improve the Delivery of Functional Lipophilic Components". Annual Review of Food Science and Technology. 1 (1): 241–269. doi:10.1146/annurev.food.080708.100722. ISSN 1941-1413. PMID 22129337. ^ a b Cauvain, Stanley P.; Young, Linda S., eds. (1 January 2006). "Ingredients and Their Influences". Baked Products. Blackwell Publishing. pp. 72–98. doi:10.1002/9780470995907.ch4. ISBN 9780470995907. ^ Bakeinfo. "Rising (fermentation)- BakeInfo (Baking Industry Research Trust)". www.bakeinfo.co.nz. Archived from the original on 20 December 2016. Retrieved 14 December 2016. ^ Carl, Hoseney, R. (2010-01-01). Principles of cereal science and technology. AACC International. OCLC 457130408. ^ Goesaert, Hans; Slade, Louise; Levine, Harry; Delcour, Jan A. (2009-11-01). "Amylases and bread firming – an integrated view". Journal of Cereal Science. Special Section: Enzymes in Grain Processing. 50 (3): 345–352. doi:10.1016/j.jcs.2009.04.010. ^ Sievert, Dietmar; Hoseney, R. Carl; Delcour, Jan A. (1 January 2000). Ullmann's Encyclopedia of Industrial Chemistry. Wiley-VCH Verlag GmbH & Co. KGaA. doi:10.1002/14356007.a04_331.pub2. ISBN 9783527306732. ^ Borwankar, R. P.; Frye, L. A.; Blaurock, A. E.; Sasevich, F. J. (1992-01-01). "Rheological characterization of melting of margarines and tablespreads". Journal of Food Engineering. Rheology of Foods. 16 (1): 55–74. doi:10.1016/0260-8774(92)90020-7. ^ Bosmans, Geertrui M.; Lagrain, Bert; Ooms, Nand; Fierens, Ellen; Delcour, Jan A. (2013-05-15). "Biopolymer Interactions, Water Dynamics, and Bread Crumb Firming". Journal of Agricultural and Food Chemistry. 61 (19): 4646–4654. doi:10.1021/jf4010466. ISSN 0021-8561. PMID 23631677. ^ Gray, J.a. ; Bemiller, J.n. (1 January 2003). "Bread Staling: Molecular Basis and Control". Comprehensive Reviews in Food Science and Food Safety. 2 (1): 1–21. doi:10.1111/j.1541-4337.2003.tb00011.x. ISSN 1541-4337. ^ a b Roca, Elisabeth; Guillard, Valérie; Guilbert, Stéphane; Gontard, Nathalie (2006-03-01). "Moisture migration in a cereal composite food at high water activity: Effects of initial porosity and fat content". Journal of Cereal Science. 43 (2): 144–151. doi:10.1016/j.jcs.2005.08.008. This page was last edited on 8 April 2019, at 08:48 (UTC).